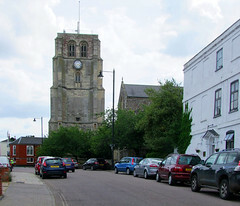 Beccles is the most urban of all Suffolk's smaller towns. Its industrialisation, and the large rural catchment around it, make it seem much bigger than it actually is. In fact,its population of just over ten thousand makes it but the eighth largest town in Suffolk. Another part of this illusion is maintained by the sheer scale of St Michael's church, and the accompanying bell tower. 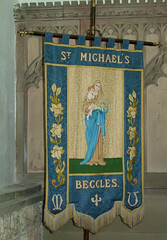 St Michael is the only church in Suffolk other than St Andrew, Bramfield, to have a bell tower separate from the body of the church. This is more common over in the fens and marshes of north Cambridgeshire and west Norfolk, which may give us a clue to what happened here. The church was built first, without a tower. A bequest of 1369 by Robert de Mutford left money for building the 'new church', and the porch, which we'll come to in a moment, was the result of a 1455 will. 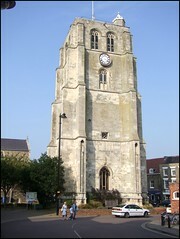 But in the early 16th century, in a display of piety, power and civic pride, the great square belfry was built to the south east. Solid, faced in stone and lined in brick, it rises almost 100 ft above the street. The parapet was never built; the Reformation intervened. But why was it built here at all? The obvious place, at the west end of the nave, is marshy, and the ground falls away to the river. And another reason, of course, is that its actual location is grander and more prominent, set on the side of the former market place. By the middle of the 20th Century, the parish found it difficult to afford its upkeep, and in the 1970s it was sold off to the Borough for the nominal sum of one penny. You walk westwards from the tower into the south side of St Michael's churchyard. 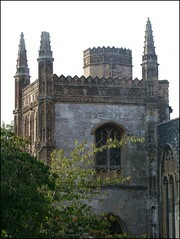 The great south porch, with its turret beyond. Now, if St Michael did not have its great bell tower, it would perhaps still be famous for its south porch. 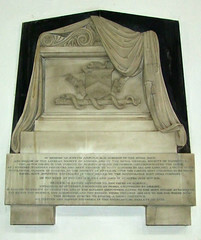 It dominates the whole of the south side, rising above the south aisle on two storeys. It is one of the biggest medieval porches in all Suffolk. Inside, bosses depict incidents in the ministry of Christ. The other interesting feature of the south side is curious. 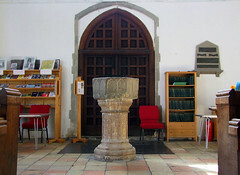 This is the small castellated porch to the chancel door. Above it, a now blocked doorway leads onto the parapet, an outdoor pulpit, apparently. Could it be a Victorian conceit? The blocked doorway matches one on the north side, except that there, it is the entrance to the rood loft stair turret. Stepping into the church, you enter a long, open space accentuated by the long arcades running towards the east. 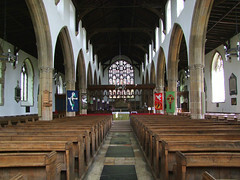 There is no chancel arch, no physical separation of nave and chancel. Everything is neatly ordered, but perhaps a little characterless. Pevsner thought it bald and grey, and in truth it is a bit sombre. This is partly the result of a terrible fire on the night of November 29th 1586, which completely destroyed the interior of the church, along with some eighty adjacent houses. Almost everything we see today postdates the fire, some of it rebuilt, the rest restored. It didn't help that the restoration of the 1860s was at the hands of John Hakewill, a local architect whose churches are rarely joyful affairs. However, your eyes are easily drawn through the 1920s screen to the star of the show, a seven-light east window, filled with glass by Heaton, Butler and Bayne. 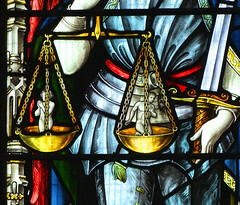 And here is another curiosity, for the figure of St Michael at the bottom holds his scales, which should contain a sinner being weighed against his sins. However, the scales here apppear to contain a man and a woman. I wonder which was intended as the sinner, and which the sin? 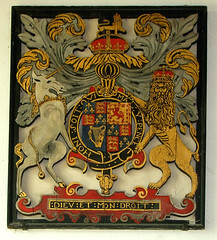 The Stuart royal arms are another oddity, because they are a fretwork design and, at first glance, you may not notice what is wrong with them. And then it strikes you that the lion and unicorn supporters are the wrong way round. In fact, both sides are painted, so as there is no chancel arch it must originally have been intended for the arms to hang from the roof and be visible from both sides. Hardly anything survives from before the Reformation, except the font. This is a cheap and cheerful Purbeck marble job of the 13th century, familiar from many a tiny village church, with its greenish stone and carved blank arcades. It seems rather unusual in such a big church, so perhaps the original font was destroyed in the fire, and this may have come from elsewhere. In short, it cannot be escaped that the great glory of St Michael is entirely vested in its exterior, especially when seen from a distance, where, as Pevsner rightly says, it is not easily forgotten. Internally, the aisles and clerestory are grand enough, but the lack of any medieval survivals means it is hard to see St Michael as much more than the rather sombre CofE parish church it has become. 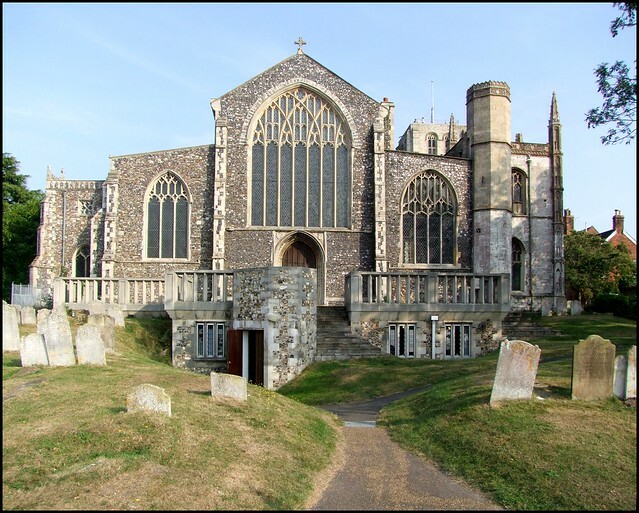 Mind you, some Suffolk churches have managed that without a fire.